Dr Clara Cotaru is a Fellow of the Australian and New Zealand College of Anaesthetists currently living and working in Belgium. Clara’s interest in the history of anaesthesia began with an investigation of the history of advertising anaesthetic agents, which she presented at the 2013 International Symposium of the History of Anaesthesia. The use of medication outside of a strictly medical context is understandably linked to controversy. Take for example, the discovery of anaesthetic drugs. Who knows if the discovery of general anaesthesia would have been made if not for the thrill seekers of yesteryear enjoying an euphoric whiff of ether. As for regional anaesthesia, injecting cocaine into the cerebrospinal fluid was designed as an attempt to achieve safe surgical conditions. An unfortunate side effect of these experiments was that many doctors became addicted to cocaine over the ensuing years. There is certainly a darker side to experimentation with anaesthetic agents. In today’s world, there are still many examples not only of controversial but also obvious misuse of anaesthetic drugs. The death in recent years of an iconic pop star during a propofol infusion intended to cure his insomnia brought propofol to the fore of the media’s and therefore the public’s attention. The current use of induction agents as a means to facilitate the death penalty in some parts of the world undoubtedly attracts controversy. Anaesthetic drugs have different effects based on the intention and skill of the user. While sometimes the associated controversy is contemporaneous, other times it only becomes obvious when looking through a retrospective lens. Bayer’s Evipan (hexobarbitone) was the not the first barbiturate to be used in clinical practice but its synthesis in 1932 by German pharmacologist Helmut Weese caused a stir, as it was the first barbiturate that was truly short-acting. Weese’s reports that in “canary birds, profound sleep is observed in 8 minutes and the animal is fully awake again in 30 minutes” was indeed good news not only for the canary birds who seemed to have survived the experiments but also for anaesthetists of the day. One of the most common questions asked by patients relates to the duration of anaesthesia and patients are pleasantly surprised that in most cases they will be awake soon after the procedure is finished. 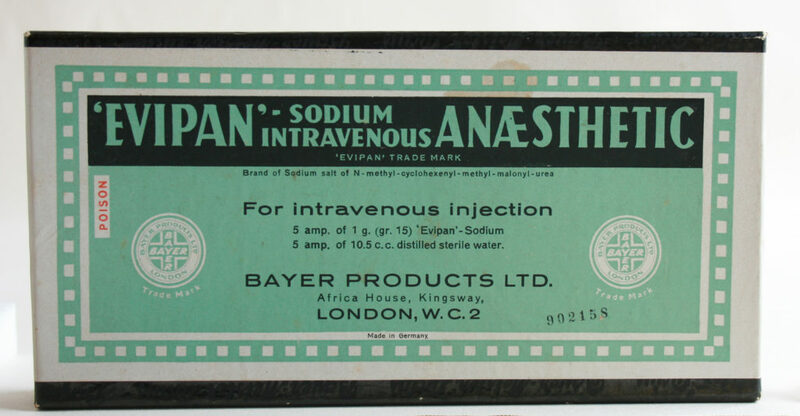 Of particular interest in the discovery of Evipan, was the ability to use it as a hypnotic agent; to create a relaxed, somnolent state while avoiding general anaesthesia. The advantage of diminishing the stress associated with entering an operating room is one still practiced today by many anaesthetists. With entry into this relaxed, hypnotic sphere, the mind is not only is disinhibited but amnesia is created as well. This state of the mind somewhere between consciousness and unconsciousness is used in everyday practice in sedation, however, is also reminiscent of the effect produced by a few too many glasses of any preferred alcoholic beverage. The reputation of mind altering substances as a source of truth has been a long-held one. The saying goes that truth is found at the bottom of a bottle of whisky/vodka/wine (insert other culturally relevant substance). Perhaps law enforcement bodies should begin imbibing suspects with cheap bottles of Chardonnay. In the late 1940s, Germany was in a state of flux. 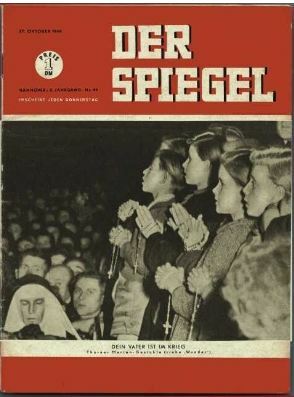 The poverty and shame that had been created by the fall of Nazi Germany and the loss of WWII created the social backdrop to a rather interesting use of Evipan. Perhaps the atmosphere of the time allowed for a different attitude to obtaining the truth. In a 1949 article of Der Spiegel, is the story of a teenage boy convicted of murdering a local farmhand who was allegedly pregnant with his child. The conviction was based on his confession the day after her body was found in a field. In this interesting tale, Heinz Abel, the accused, is sent to a psychiatric institution by his defence lawyer who concludes, after discussions with his client, that “he has the emotional and moral intelligence of a 14 year old”. Whilst in the Hamburg Psychiatric Clinic, Abel is analysed over a period of six weeks by the Psychiatric Professor Burger Prinz. Over that time he is also injected with Evipan in an attempt to explore and understand his subconscious mind. Whilst under the influence of Evipan he denies several times the murder of which he is accused. Upon awakening, he has no recollection of what he has said whilst under the influence. 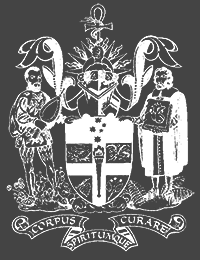 The use of Evipan, and the resulting revelations, are mentioned to neither Abel’s lawyer nor the court. According the to article, this was due to the fact that both the scientific and legal professions would be in a state of anger at the “Americanisation of the criminal procedure by permitting … narcotic analysis”. This in itself is an interesting reflection on the political tensions at the time, Germany having been divided for control amongst the allied states. This statement begets the potential disgruntlement amongst the German people at the lack of control they felt. The results of the alleged denial didn’t help Abel much in his case. However, the reader is left feeling that perhaps the evidence should have been brought forward. The entire article alludes to the fact that Abel had underlying psychiatric illness. In regards to the use of Evipan outside a strictly anaesthetic setting, this article leaves the modern day reader with a lot of questions. The ethics of the use of mind-altering substances is in a constant state of change. The goal of using anaesthetic agents must constantly be questioned. The flux between consciousness and unconsciousness can be a delicate one and anaesthetic agents lie in a crucial point within this flux. However, it is certain that the dark side to anaesthesia exists and it exists not within the substance delivered but the way in which it is dispensed.